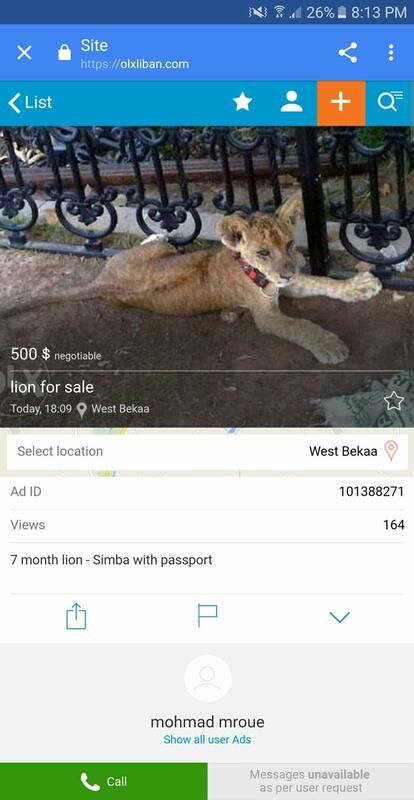 Animals Lebanon - OLX stops sale of lion! OLX stops sale of lion! Despite a recent ban on the private ownership of all big cats, some people will always try to find a way around. Luckily an attempt to use OLX to sell a lion was stopped as the website removed the ad and banned the user after we complained. If you see any posts of any big cats advertised on OLX or other online marketplace - report it to them and notify us so we can follow up. Go to www.animalslebanon.org/bigcats to take action - it's the last chance for big cats!